When you are grounded you are fully present, your mind is still, and you are completely focused. It is from this place of being grounded that we operate most effectively and therefore are optimized for success in any endeavor. To be grounded is to experience a state of peaceful awareness from where one is most effective. The mind is quiet. It is uncluttered with thoughts, especially unproductive limiting thoughts. When one is grounded, they are “in the flow” and “connected”. There is an acute awareness of the body, the environment, and a sense of presence. Dwelling on the past and worrying about the future is replaced by an intense focus on the present moment. One is not judgmental of oneself, others, or their situations. Free from the shackles of the “monkey mind”, feelings of happiness, joy, love, enthusiasm, confidence, and well-being flow naturally. Healthy and productive choices come more naturally in this place. Personal strength, adaptability, and emotional stability all come from a state of groundedness. This is our natural state and it is where we can most effectively create and attract the results we want in our lives. This state exists all the time within us. All we need to do is remember it. When you are grounded, you can rewrite the script of the mind to be whatever you want it to be… so you can have whatever you want. All it takes to learn to be grounded more regularly and rewrite this script is a little guidance and persistence. This blog and the corresponding videos sponsored by Think Positive Apparel will provide simple tools to get grounded and manifest your dreams! 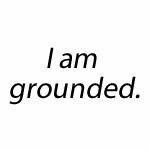 By consciously practicing becoming grounded, we are able to more frequently come from this state. Like most everything, the more you do it, the easier it becomes. We start our day with a series of grounding exercises so that we can carry it with us into our day and remind ourselves to quickly ground before important activities. I just discovered this little gem that was written in 2011. I was trying to find out what being grounded meant if you were struck by lightening and I couldn’t find an answer so I asked the question that brought me here. When I was a teenager way back in the mid-20th century I was always getting grounded by my parents when I came home later than we had agreed. So here I am in my 60s thinking about that word from the 60s and thinking I would really like to be grounded, and this is why I practice daily meditation and exercise at a gym and fellowship with other people who seek to be grounded day by day. So thank you for these wonderful words and I will see what else is in store for me here where I can enjoy being grounded. Although I never heard about this I should inform you that I used to be so confused because my life turned to be the opposite of what I have planned it to be. Even though I tried to do things right I found that I needed to be happier. I was going through some hardship, and I started to wonder why; but one day I said: “God I don’t know why things are like this, but don’t change anything, change me” The very next day I started to act the way you present in this message. I became the happiest person on earth showing the description you have in your message. I started to write poems and songs that flew out of my mind. (in Spanish) But I was not up in heaven. I was grounded. That’s why the translation of my e-mail is prissy the happy one.